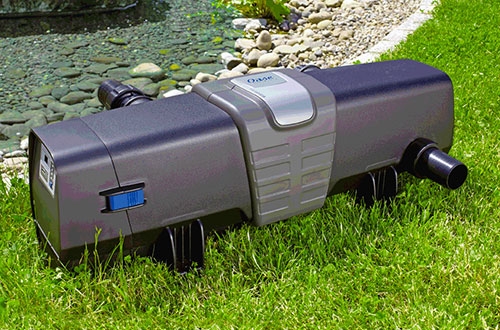 Highly efficient Oase self-cleaning ultraviolet clarifiers (UVC) for garden ponds. The Bitron C models connect directly to Oase Biotec and Biosmart filters. OASE Bitron UV Clarifiers feature cutting-edge technology for ridding ponds of green water, caused by single celled algal growth. The self-cleaning mechanism utilises the flowing water to spin the cleaning rotor, which prevents debris from settling on the quartz glass sleeve. The water bypass mechanism ensures the maximum kill rate of suspended algae, whilst diverting any excess water flow. The Bitron UVC can also be directly connected to Oase Biosmart 30000 and Biotec Screenmatic Filter Boxes (except for the Bitron Gravity model which is primarily designed for use with the Proficlear Premium Specialist Koi Filter System). Scroll down the page to view Bitron comparison chart.